Pedalling Squares: Winning: Grounds for Suspicion? When I wrote about my thoughts on WADA's reasoned decison against Lance Armstrong last year, I started by saying that there were too many contradictory feelings pulling at the structure of what I was writing, and that my best hope was to splurge - to present an account of my feelings as opposed to an actual essay or editorial. I think I'm going to use the same approach for writing about Chris Froome. My confusion when it came to Armstrong stemmed from the fact that I condemned him for doing things that I'd forgiven other riders for. My confusion with Froome comes from the fact that I thought he looked suspicious way back during the 2011 Vuelta a Espania, but that I'm getting really annoyed with everyone being suspicious of him now. There are plenty of conflicting opinions on Chris Froome - Antoine Vayer has declared that his performances are suspicious, L'Equipe has said that they aren't, the French Senate think it's unfair to have a whispering campaign against him, and the roadside fans have made their confusion and suspicion known with a variety of banners, the simplest of which was also the most expressive, saying only "Froome?" What exactly has Chris Froome done that's so suspicious? Well, he's won the Tour de France for starters - a feat previously managed by, among others, Lance Armstrong, Marco Pantani, Jan Ullrich, Floyd Landis and Bjarne Riis. To be fair, it is also a feat manged by Carlos Sastre, Bradley Wiggins and Cadel Evans, none of whom (not even sweary Bradley) have been the subject of as much of the suspicion that Froome has been under. The fact is, Evans, Wiggo and Sastre all looked vulnerable while winning. Evans had to dig deep to rein in Andy Schleck's multi-mountain attack. Sastre got his victory by spending one good day attacking his teammate, and for all Wiggo's dominance in the TT, we'd all seen what happens to him on particularly long or steep climbs - his TdF win was made possible in part by the fact that France has no Angliru! 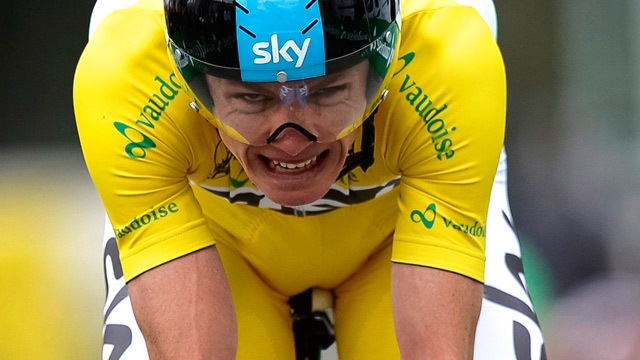 Froome, on the other hand, created an air of dominance in this year's Tour de France, dashing away from the best climbers in the world on the steep stuff, whilst also winning one time trial and coming second in another. No wonder he's been lumped in with the TdF winners who crushed their opponents at the time, and then had their victories asterisked or struck out further down the line. There were times when his team looked vulnerable, and he could have paid a hefty price for forgetting to eat, but in terms of strength compared to his rivals, he looked tougher than the rest by a significant margin. I'll confess right now, there were moments during this year's Tour, especially during the Time Trials, where I was rooting for Froome to lose, and greeted his first and second places with the annoyance a grown up would show to a child who doesn't know any better. "Don't win it!" I'd be thinking at Froome, "Don't you know what it will look like if you smash everyone against the clock as well as on the mountains?" This tends to be my benchmark for being suspicious of riders, the TGTD (too good at two disciplines) flag. Remember 1999? Remember watching Armstrong and wondering how a guy previously known only as a Classics rider suddenly had three weeks' worth of stamina and the ability to beat the best time triallists against the clock and the best climbers on the mountains? 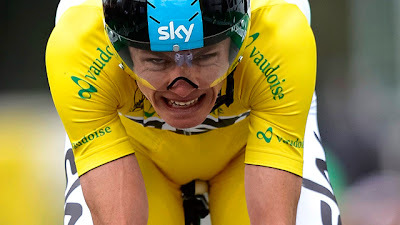 Thus far the only thing we can prove against Chris Froome is the sin of looking a little too much like Lance Armstrong. Which is not the same as using Armstrong's methods, but goes a long way towards explaining why people are so suspicious of him. Of course, Armstrong's USPS/Discovery teammates were also doped up to the eyeballs, and were capable of squeezing the life out of the race, a charge that has been laid at Sky's door in previous Tours, but was pretty far from the truth this year - sure, they dominated a few stages, but they also collapsed quickly and completely on the second Pyrenean stage, got monstered by the crosswinds, and could muster progressively fewer riders on the front as the Tour wore on. A Postal-style invulnerable superteam they definitely were not. Where Armstrong's Tours looked suspicious because his previous was all in one day races, Froome has been given a lot of grief for having no previous at all. To me, this is one of the weaker bases for suspicion. Sure, when Bjarne Riis waited until his early thirties to start challenging Indurain in the time trials and destroying the entire peloton in the mountains, that looked a bit shaky, but Chris Froome is 28. It's not like he has decades of being a water carrier to make his elevation to star look suspicious. He won a stage race, the Tour of Mauritius, in his final year as an amateur, turned pro in 2007, spent the traditional couple of seasons grovelling like a newbie, got his first grand tour podium in 2011, another in 2012 and then took a win in 2013. Compare that to, say, Jan Ullrich, who turned pro in '95, got a podium at the Tour in '96, and won it by over seven minutes in '97, and tell me again that it's Froome's development that looks suspicious. I'd argue that, even leaving the Bilharzia infection aside, we've seen Froome grow into the role of Tour winner, from being a rider with, as I've said numerous times before here and here, more strength than savvy. The "He must be doping, he's got no previous" argument has cropped up a few times recently, in connection with Riche Porte and Nairo Quinatana. With Porte, it came largely from fans and was easily dismissed here. With Quintana, it was particularly galling, as Universal Sports announcers Steve Schlanger and Todd Gogulski questioned Quintana's sporting ethics on air for no other reason than he'd "come out of nowhere". It's hard to think of a more nauseating piece of cycling journalism in recent years. For starters, any casual cycling fan could have told them that Quintana had won stages in the previous years Vuelta and Dauphine, and more dedicated fans would have probably pointed out that he's also won the Route du Sud in 2012, the mountains jersey of the Volta Catalunya in 2011 and the Tor de L'Avenir in 2010. More annoying is the fact that for ten years barely any US journalists bothered to question the fact that a Texan with an all American name was pulling off cycling feats far beyond anything he'd ever shown any sign of being capable of, but as soon as a chap from south of the border starts winning races, suddenly this duo thinks they're Woodward and Bernstein, asking hard questions. The idea that previous form is a good way of assessing whether a rider is cheating is flawed. It doesn't take into account maturing riders, or changing teams, or the fact that cycling might actually be getting cleaner, allowing previously overshadowed riders a chance to shine now that the playing field is marginally more level. I can find you cheats who were consistent throughout their careers, and cheats whose form vacillated wildly. I can do the same for clean riders. The fact is, as Podium Cafe has recently pointed out, neither previous form nor displays of strength prove anything anymore, simply because we have no benchmark for watching clean riders in a clean peloton. The last time we saw a clean peloton (by which I mean one that was using amphetamines and sleeping pills rather than EPO and blood transfusions) was in the era of steel bikes, steak for breakfast, big gear riding and no TT bars. We have an idea of what clean cyclists looked like before cycling got scientific, and an idea of what dirty riders looked like when they could get away with anything, but very little idea of what clean riders look like in an age of scientifically aggregated "marginal gains".We have no way of knowing whether a rider stands out because he's cheating, or because his rivals have stopped cheating, and with no guideline for suspicion, we've entered an age in which winning itself is seen as adequate grounds for speculation. We know that cycling hasn't entirely cleaned up its act, the positive tests at the Giro proved that, and we also know that it's possible for riders to evade detection. This uncertainty has led us into a situation where riders are guilty until proven innocent. The constant talk about who is or isn't doping is potentially as damaging to the sport as the old system of omerta in which doping wasn't mentioned at all. After all, if clean riders are going to be jeered, interrogated and pissed on regardless, doesn't the moral victory of riding clean start to feel hollow? If the only reward for riding clean is to be treated like a doper anyway, you might as well find a a way of guaranteeing some wins to go with it. In the days when the majority of riders were doped but we didn't talk about doping, you could at least kid yourself that some winners were clean. These days, with a new generation of riders outspokenly riding clean and a greater chance of clean victories than we've had in years, we've somehow all decided to treat every victory as if it was doped. It's the most hopeful period we've had in cycling for many years, and the fans and cycling media are treating the sport as if it's beyond hope. While I'd never advocate a return to the days of omerta, I think these current days in which a lot of fans choose to believe that every winning ride is a doped one comes dangerously close to creating a self-fulfilling prophesy.